Creating your first ad and campaign on Verizon Media properties is easy and fast. You can get rapidly up to speed in less than a few minutes. 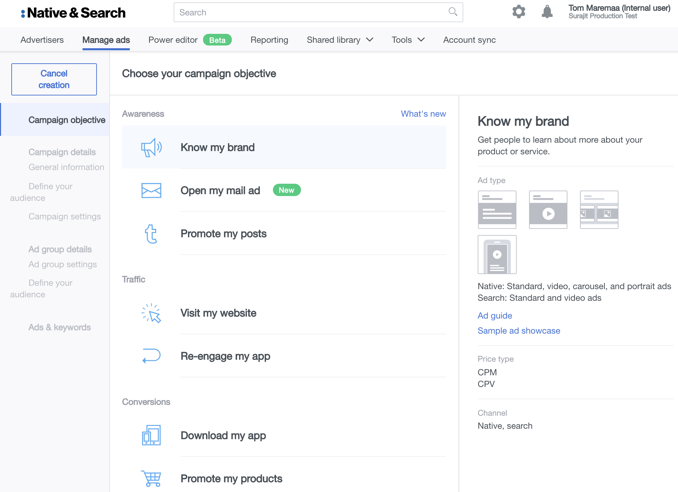 Once you define your campaign objectives in the Native & Search user interface, you’ll be off and running as you add images, text and videos. Explore some of the topics in this section to successfully create and manage your Native & Search ad campaigns. How to create new campaigns Describes how to choose a campaign goal when creating a new ad campaign. How to manage your campaigns Explains how to manage and optimize your campaigns, go live or pause your campaigns, and filter lists of your campaigns. How to create your first ad Describes where your ads run, how to create and manage your ads, as well as deleting ads. How to preview your ad on Verizon Media properties Describes how to preview your ads. Drive traffic to your website Discusses the tools and resources you need to drive traffic to your website with your ads and campaigns. Raise brand awareness Describes the ad types and required assets you need to raise brand awareness for your ad campaigns. Drive app installs on mobile Explains the delivery of app install ads and the required assets. FAQs Lists some of the most frequently asked questions about campaign and ad group creation.